I don't make New Years resolutions because quite frankly, I don't like the pressure and when I tell myself I can't have something, I want it even more. That last quality does not exactly coincide with my major lack of will power especially with guilty food. So while I make myself eat healthy most of the time, when I want something good, I'm gonna have it. And it most often includes something deep fried. Now these shrimp, ooooh baby, these shrimp rock my world. They're sweet, crunchy, juicy and totally hit the spot. When I make them I fry up a large batch and serve them with my 3 favorite dipping sauces (I can never just pick one). That's another of my bad qualities - indecisiveness. But one thing is for sure, I never have to think twice about indulging in these beauties. 1. Heat oil in a deep, heavy pot or fryer on stove. Oil should be 3-4 inches below the top of the pot. Heat oil to 375 degrees. 2. As if working in an assembly line, In one bowl mix the flour, salt and pepper. In another bowl add the eggs and beat lightly. Put the bread crumbs in a third bowl. 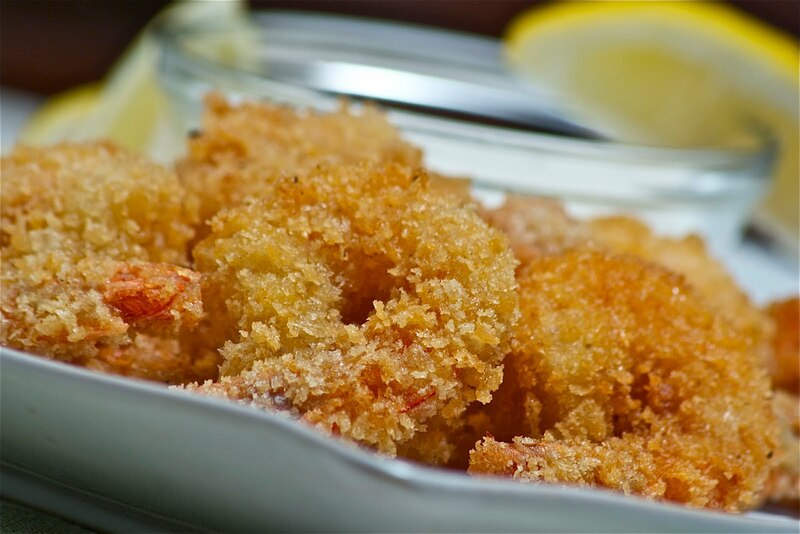 Working in batches, dredge the shrimp in flour and shake off excess, dip the shrimp in the egg again shaking off excess, then into the bread crumbs to coat thoroughly. When you have 6 breaded add them to the hot oil making sure not to crowd the pan. Let them fry, turning once, until golden brown about 3-4 minutes per side. Remove with a skimmer or slotted spoon. Put on a wire rack lined with paper towel with paper towel and repeat with the remaining shrimp. Sweet and crunchy sound so good. I love shrimp..I always have some in the freezer and just pop them in the microwave when I want a snack.